Chamber Music at the Clark concert seating is determined via lottery. The booking-by-lottery entry form for Horszowski Trio concert seats posts here on Thursday, February 18, 2016. Lottery registration closes Thursday, March 10, 2016. Hailed by The New Yorker as “destined for great things,” the Horszowski Trio made its formal debut in 2011. Two-time Grammy-nominated violinist Jesse Mills first performed with Raman Ramakrishnan, founding cellist of the Daedalus Quartet, at the Kinhaven Music School when they were children. In New York City they met pianist Rieko Aizawa, who, upon being discovered by the late violinist and conductor Alexander Schneider, made her United States debuts at the Kennedy Center and Carnegie Hall. Their musical bonds were strengthened at various schools and festivals around the world, including the Juilliard School and Marlboro Festival. The ensemble often collaborates with guest musicians—violists, clarinetists, and singers—including members of the Pacifica, Guarneri, and Tokyo Quartets. The Trio honors legendary pianist Mieczysław Horszowski (1892–1993), whose last pupil at the Curtis Institute was Rieko Aizawa, and takes its inspiration from the maestro’s musicianship, integrity, and humanity. The group seeks to perform works from the trove of composers with whom Horszowski had personal contact, such as Ravel, Saint-Saëns, Fauré, Martinu, Villa-Lobos, and Granados. 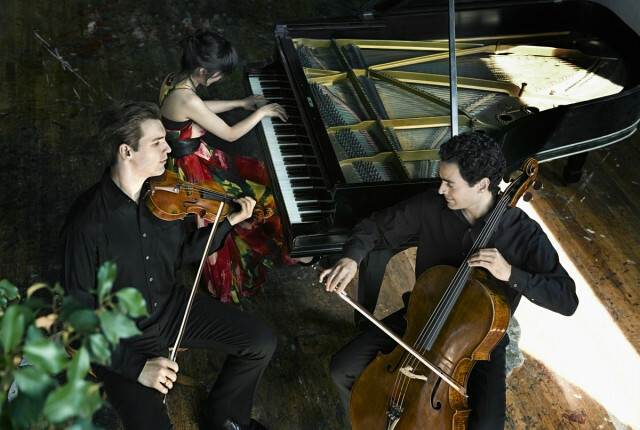 The Trio’s debut recording, an album of works by Fauré, Saint-Saëns, and d’Indy—in memory of Mieczysław Horszowski—was released by Bridge Records in 2014.